When Ludwik L. Zamenhof created Esperanto in the 1870s, his main intention was to introduce a simple (and, crucially, neutral) language that would easily connect and (re)unite communities stuck in deep ethno-linguistic conflicts. Zamenhof was an idealist, an early internationalist living in a transnational environment, a multi-ethnic empire in a time of increasing nationalism and national division. The ambition of this project is to understand the particular reasons why Esperanto failed in its place of origin, yet succeeded in particular regions across western Europe and thus became a transnational phenomenon in its own right. Why, is the ultimate research question, did Esperanto flourish in specific areas of western Europe? In particular in an area driven by national enmity between France and Germany. Who were the activists in this community of convinced speakers and dedicated supporters of a neutral language? The project investigates the background, origins, beliefs, and actions of those who joined Esperantist societies, learned and promoted that language, and will also focus on certain key actors through prosopographical research. It is the underlying working hypothesis that Esperanto was driven by a civil society of like-minded internationalists who supported cross-border and transnational cooperation during a phase of rising international tension during the two decades prior to the First World War. Key of the prosopographical analysis will be to link the Esperanto enthusiasts to other transnational projects and societies (academic, social, political, scientific). As such the project will make a contribution to the emerging field of late nineteenth century internationalism (NGOs, World Fairs, humanitarian aid, Red Cross) prior to the more formal turn to internationalism (in the form of the League of Nations and later the UN). 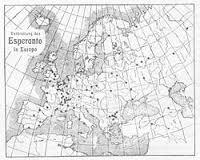 The project will attempt to map the different spatial and social territories where Esperanto found key support, and will seek to find which geographical spaces and regions (the Rhineland, Western Europe) witnessed and facilitated that phenomenon. Finally, the project will focus on the case of Neutral Moresnet through an analysis of its unique spatial setting, and the involvement of Dr Wilhelm Molly in the debate around Neutral Moresnet’s adoption of Esperanto as official language. A dedicated research trip to the region will seek to offer an in-depth analysis of this particular case that embodies the peak of the Esperanto movement in the late 1900s.